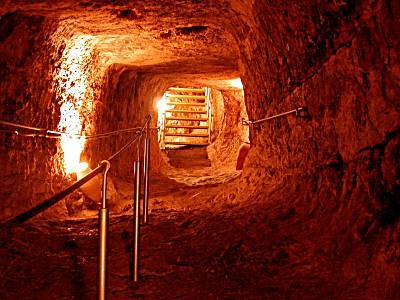 Warren's Shaft is an archaeological feature in Jerusalem discovered in 1867 by British engineer Sir Charles Warren (1840–1927). It runs from within the old city to a spot near the Gihon Spring, and after its 19th-century discovery was thought to have been the centrepiece of the city's early water supply system, since it would have enabled the city's occupants to safely reach fresh water in times of siege. In 2005, archaeologists discovered the ruins of a pair of walls that would have protected the overland path to the spring prior to the tunnel's construction. The narrow and tall shaft was demonstrated to be traversable when a member of Warren's excavation climbed from top to base. Since in the Books of Samuel it states that David conquered Jerusalem from its prior inhabitants, the Jebusites, due to Joab sneaking up a similar water shaft and launching a surprise attack on the city from inside, it was long thought that Warren's shaft was the shaft in question (with the Siloam tunnel having too late a date, and there being no other known candidates). According to a number of archaeologists, the shaft is simply a widening of a natural fissure in the rock. The 14-metre-high shaft, which has a pool of water at the base, is now not actually thought to have been part of the system. In 1998, while a visitor centre was being constructed, builders discovered that there was an additional passageway, about 2 metres higher and starting from the horizontal curved tunnel, that skirted the 14 metre vertical shaft, and continued to a pool much nearer the Gihon spring. 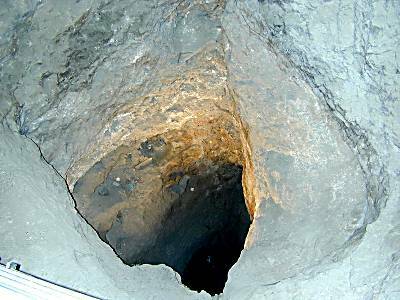 The 14 metre shaft is too narrow, and the pool at its base too shallow, to have been functional, and archaeologists now believe that it is merely a natural fissure that the original excavators happened to breach during their dig towards the other pool. The higher passageway was not originally higher—at some point Warren's shaft was lowered (cutting into a geologically distinct type of rock), and ran into the 14 metre vertical shaft. The pool reached by the higher passage was protected by a large tower, which was also discovered by the visitor centre builders, and is located outside the former city. The pool connects to the Gihon spring via a narrow channel, and the Gihon was itself protected by a large tower (also recently discovered). The pool itself may have been protected by a second tower, but this is uncertain as excavation of the southern side of the pool has not yet been carried out, since it lies under a current residential area. Ceramics found in the tunnels by these more recent archaeological excavations firmly date the Warren's shaft system, and the tower defences, to at least the 18th century BC. This expressly places it as having been developed in the time when Canaanites controlled Jerusalem. Valter Juvelius (left) around 1909-1911 in the Siloam tunnel. General Sir Charles Warren, (7 February 1840 – 21 January 1927) was an officer in the British Royal Engineers. He was one of the earliest European archaeologists of the Biblical Holy Land, and particularly of the Temple Mount. Much of his military service was spent in British South Africa. Previously he was police chief, the head of the London Metropolitan Police, from 1886 to 1888 during the Jack the Ripper murders. His command in combat during the Second Boer War was criticised, but he achieved considerable success during his long life in his military and civil posts. The City of David (Hebrew: עיר דוד, Ir David; literal translation to Arabic: مدينة داوود‎, Madina Dawud, also known as the Wadi Hilweh (وادي حلوه, Wadi Hilweh) neighborhood of Silwan, is an Israeli settlement and the archaeological site which is speculated to compose the original urban core of ancient Jerusalem. First suggested in 1920, the name was used officially from the 1970s, following the capture of East Jerusalem by Israel, but today the name is questioned in the archaeological academic community. In 1997 management of the park was taken over by Ir David Foundation. Although it is located within the Jerusalem Municipality, it is considered a settlement, having been built on land in the West Bank that was occupied by and annexed to Israel following the 1967 Six-Day War and 1980 Jerusalem Law. The international community regards Israeli settlements illegal under international law, although Israel disputes this. It is best known for its Iron Age structures attributed to Judean kings, and it also contains older Canaanite infrastructure dated to the Middle Bronze Age. The site is located under the Arab neighborhood of Wadi Hilweh, and extends down from the southern city walls of Jerusalem's Old City. The remains at the site include several water tunnels, one of which was built by King Hezekiah and still carries water, several pools including the Pool of Siloam known from the Old and New Testaments, and here or at the adjacent Ophel scholars expect to find, or claim to have found, the remains of the Acra, a fortress built by Antiochus Epiphanes to subdue those Jerusalemites who were opposed to Hellenisation. City of David archaeologist Eilat Mazar believes that a so-called Large Stone Structure she has discovered at the upper area of the site and tentatively dated to the tenth to ninth century BC, may be the palace of King David. Not far from that excavation area a number of bullae (seal impressions) were unearthed, bearing the names of Yehucal son of Shelemiah and Gedaliah son of Pashhur, two officials mentioned in the Book of Jeremiah. The area is one of the most intensively excavated sites in the Holy Land. Archaeological practice at the site has been criticized with practitioners not acknowledging political and corporate motivations, questionable field practice and overtly skewed interpretations.The debate within biblical archaeology over the location of the City of David began in the late 19th century with the excavations of Charles Warren and Hermann Guthe on the hill southeast of the Old City. The 1909–11 work of Louis-Hugues Vincent and Montagu Brownlow Parker identified the earliest known settlement traces in the Jerusalem region, suggesting the area was an ancient core of settlement in Jerusalem dating back to the Bronze Age. It is on a narrow ridge running south from the Temple Mount in the predominantly Arab neighborhood of Wadi Hilweh, which is part of Silwan, an East Jerusalem suburb. It is thought to have been a walled city in the Bronze Age which enjoyed the defensive advantages of its position, as it is almost surrounded by the Central or Tyropoeon Valley to its west, by the Hinnom Valley to the south, and the Kidron Valley on the east. In the pre-Israelite period, the area is thought to have been separated from the site of the later Temple Mount by the Ophel, an uninhabited area which became the seat of government under Israelite rule. During the reign of Hezekiah, the walls of Jerusalem were expanded westward, across the Central Valley from the City of David and the Temple Mount, enclosing a previously unwalled suburb in the area known today as the Western Hill of the Old City. The City of David/Wadi Hilweh is highly controversial in the context of the Israeli–Palestinian conflict. In 2018, a leaked report by the European Economic Community cited the area as one being developed for tourism to justify settlements and insist on Jewish heritage at the expense of its Palestinian context. For the river mentioned in Genesis, see Gihon.The Gihon Spring (Hebrew: מעיין הגיחון‎) or Fountain of the Virgin in the Kidron Valley was the main source of water for the Pool of Siloam in the City of David, the original site of Jerusalem. One of the world's major intermittent springs—and a reliable water source that made human settlement possible in ancient Jerusalem—the spring was not only used for drinking water, but also initially for irrigation of gardens in the adjacent Kidron Valley which provided a food source for the ancient settlement. The spring rises in a cave 20 feet by 7. Being intermittent, it required the excavation of the Pool of Siloam which stored the large amount of water needed for the town when the spring was not flowing. The spring has the singular characteristic of being intermittent, flowing from three to five times daily in winter, twice daily in summer, and only once daily in autumn. This peculiarity is accounted for by the supposition that the outlet from the reservoir is by a passage in the form of a siphon.The spring is under the control of the Israeli settler organization Ir David Foundation ("El'ad"); it is sometimes used by Jewish men as a sort of mikvah. According to the Hebrew Bible, the Jebusites (; Hebrew: יְבוּסִי, Modern: Yevusi, Tiberian: Yəḇûsî ISO 259-3 Ybusi) were a Canaanite tribe who inhabited Jerusalem prior to the conquest initiated by Joshua (11:3 and 12:10) and completed by King David (2 Samuel 5:6-10). The Books of Kings as well as 1 Chronicles 11:4 state that Jerusalem was known as Jebus prior to this event. According to some biblical chronologies, the city was conquered by King David in 1003 BCE. The identification of Jebus with Jerusalem is disputed. List of archaeological excavations in Jerusalem is an incomplete list of archaeological excavations in Jerusalem. The following is a list of artifacts—objects created or modified by human culture—that are significant to biblical archaeology. This article lists significant public places in the city of Jerusalem. Montagu Brownlow Parker, 5th Earl of Morley (13 October 1878 – 28 April 1962) was a British aristocrat and army officer, best known for being one of the first real-life "Raiders of the Lost Ark". Lord Morley's father was Albert Edmund Parker, 3rd Earl of Morley. He was educated at Eton and served as a Captain in the Grenadier Guards in the Second Boer War between 1900 and 1902, where he was wounded. He was Aide-de-camp to GOC Germiston District, South Africa in 1902 and to GOC Home District in 1903. He fought in the First World War during which he was mentioned in dispatches and decorated with the Croix de Guerre. He inherited the earldom and other titles in 1951 after the death of his older brother Edmund Robert Parker, 4th Earl of Morley. Lord Morley led the "Parker Expedition", which carried out excavations searching for treasure from Solomon's Temple between 1909 and 1911. Neil Asher Silberman described the expedition as "Conceived in folly, but planned with cunning, the Parker Mission had come to Jerusalem with a single goal: to locate and unearth the fantastic treasure of Solomon’s Temple buried beneath the Temple Mount. "Lord Morley died at the age of 83 in 1962. He was unmarried and was succeeded in the earldom and other titles by his younger brother's son John St Aubyn Parker, 6th Earl of Morley. Ronny Reich (born 1947) is an Israeli archaeologist, excavator and scholar of the ancient remains of Jerusalem. The Siloam Tunnel (Hebrew: נִקְבַּת הַשִּׁלֹחַ, Nikbat HaShiloah), also known as Hezekiah's Tunnel is a water channel that was carved beneath the City of David in Jerusalem in ancient times. Its popular name is due to the most common hypothesis that it dates from the reign of Hezekiah of Judah (late 8th and early 7th century BC) and corresponds to the "water works" mentioned in 2 Kings 20:20 in the Hebrew Bible. According to the Bible, King Hezekiah prepared Jerusalem for an impending siege by the Assyrians, by "blocking the source of the waters of the upper Gihon, and leading them straight down on the west to the City of David" (2 Chronicles 32). Support for the dating to Hezekiah's period is derived from the Biblical text that describes construction of a tunnel and to radiocarbon dates of organic matter contained in the original plastering. 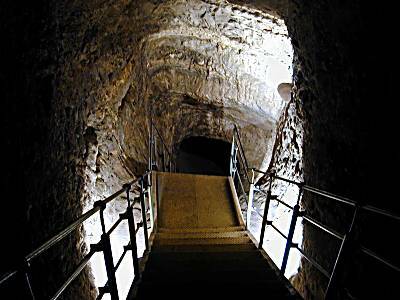 However, the dates were challenged in 2011 by new excavations that suggested an earlier origin in the late 9th or early 8th century BC.The tunnel leads from the Gihon Spring to the Pool of Siloam. If indeed built under Hezekiah, it dates to a time when Jerusalem was preparing for an impending siege by the Assyrians, led by Sennacherib. Since the Gihon Spring was already protected by a massive tower and was included in the city's defensive wall system, Jerusalem seems to have been supplied with enough water in case of siege even without this tunnel. According to Ahron Horovitz, director of the Megalim Institute, the tunnel can be interpreted as an additional aqueduct designed for keeping the entire outflow of the spring inside the walled area, which included the downstream Pool of Siloam, with the specific purpose of withholding water from any besieging forces. Both the spring itself, and the pool at the end of the tunnel, would have been used by the inhabitants as water sources. Troops positioned outside the walls wouldn't have reached any of it, because even the overflow water released from the Pool of Siloam would have fully disappeared into a karstic system located right outside the southern tip of the city walls. In contrast to that, the previous water system did release all the water not used by the city population into the Kidron Valley to the east, where besieging troops could have taken advantage of it. The curving tunnel is 583 yards (533 m) long and by using the 12 inch (30 cm) altitude difference between its two ends, which corresponds to a 0.06 percent gradient, the engineers managed to convey the water from the spring to the pool. According to the Siloam inscription, the tunnel was excavated by two teams, one starting at each end of the tunnel and then meeting in the middle. The inscription is partly unreadable at present, and may originally have conveyed more information than this. It is clear from the tunnel itself that several directional errors were made during its construction. Recent scholarship has discredited the idea that the tunnel may have been formed by substantially widening a pre-existing natural karst. How the Israelite engineers dealt with the difficult feat of making two teams digging from opposite ends meet far underground is still not fully understood, but some suggest that the two teams were directed from above by sound signals generated by hammering on the solid rock through which the tunnelers were digging.